Hastings Entertainment is a successful brick and mortar chain with more than 140 locations in the United States. Their entertainment superstores sell new and used books, music, videos, games and more. Hastings recognized that their loyal customers had a growing interest in eBooks. The company decided to integrate the sale of eBooks into their already successful goHastings website—to retain their loyal customers and compete for new customers in the growing eBook market. They committed themselves to delivering a seamless end-to-end mobile shopping and reading experience. Hastings turned to Bluefire Productions to build the goHastings Readmor apps for iOS and Android. They also decided to launch their own white-label Android device, again with the help of Bluefire. The Readmor app for Android gives customers the ability to shop for books and read books in the Hastings branded and managed environment. Customers can download the app on their Android phone or tablet, or purchase a device in a Hastings store. The device sold in the stores has the Readmor app pre-installed, so new users can shop and read right away. 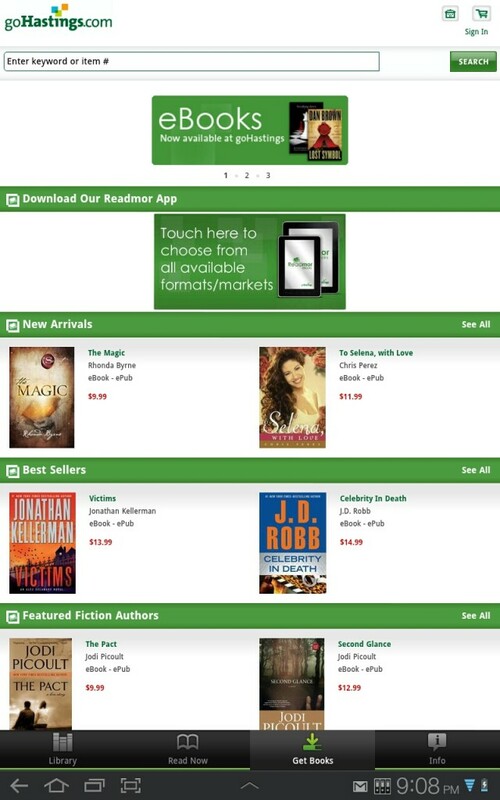 The Bluefire powered Readmor app enables customers to explore the hundreds of thousands of eBooks on sale goHastings.com. Now, Hastings loyal customers can build their personal eBook collections with new releases, a deep catalog of backlist titles, free eBooks and more. The iOS Readmor app makes it easy for iPhone and iPad users to download and read previously purchased eBooks. iOS users can also shop through the mobile Safari browser. Bluefire Reader integrates Adobe® digital publishing technologies, the most widely used eBook distribution and reading system. The Adobe Reader Mobile-based applications support ePUB and PDF content, including files protected by Adobe Content Server (ACS) encryption technology. Founded in 1968, Hastings Entertainment, Inc. is a leading multimedia entertainment retailer that combines the sale of new and used books, videos, video games and CDs, and trends and consumer electronics merchandise, with the rental of videos and video games in a superstore format. They currently operate 140 superstores, averaging approximately 24,000 square feet, primarily in medium-sized markets throughout the United States. They also operate three concept stores, Sun Adventures Sports, located in Amarillo, Texas and Lubbock Texas, and TRADESMART, located in Littleton, Colorado. www.goHastings.com is an e-commerce Internet Web site that makes available to our customers new and used entertainment products and unique, contemporary gifts and toys. The site features exceptional product and pricing offers. On the Adobe eBook Platform – Part 6 of 10: Why Should I Care? We are in the early stages of a very rapid global transition from print to digital for long format text content. This revolution will dramatically alter how content is created, distributed, sold and read. The changes will make a powerful impact on nearly every corporation, institution, bookseller, publisher, library and individual reader worldwide. This transition is being shaped and greatly accelerated by the growth of handheld devices and by the adoption of reflowable document file formats, such as ePUB, that make reading on these devices appealing and productive. The opportunities that this revolution presents are immense for education, entertainment and professional development. The costs of production and distribution are dropping dramatically. Geographical barriers are disappearing. New markets and audiences can be reached on a global scale—in homes, offices, on the road, or sitting by the pool. These changes are enabling new business models. Organizations have the opportunity to gain valuable insights into how, when and where content is used and to engage audiences in two-way conversations in contexts that were simply not possible before. This shift presents mighty challenges as well. Reading software can be time-consuming and expensive to develop and it requires rare technical and industry specific expertise. Content creators and owners are concerned about the ease with which digital files can be copied and redistributed, and thus they often demand the use of rights management technologies—which adds another layer of cost and complexity. And while these technology hurdles are pretty significant, navigating the supply chain is a far greater challenge. That’s because most organizations (especially trade booksellers) must exist in an ecosystem of suppliers and service providers that need to integrate and coordinate with each other to survive and thrive. They require common file formats, rights management systems, fulfillment systems, licensing agreements, metadata APIs, and so forth. This situation has set the stage for a very few large corporations with deep pockets and market leverage to make major strides early in this transition. These corporations are capturing large portions of the consumer ebook market, and perhaps more dangerously, mindshare. Of course, we’ve all seen how the Internet leads to monopolistic tendencies, or at least is a fertile ground for building market dominance. You can probably think of many examples of this: eBay, Google, iTunes, Craig’s List, Amazon and the list goes on… And in the world of books, we have the additional wrinkle of operating system and device makers with ambitions to become the world’s largest booksellers. This threat of market dominance presents significant risks for almost all other participants in the digital publishing space including authors, publishers, independent and regional booksellers, educators, libraries and especially consumers. It is particularly troubling that these private ecosystems close off the opportunities for ongoing direct two-way communication between content creators, owners and their audiences, and the insights that can otherwise be gained from direct audience engagement. And as we all know, when markets are dominated by only a few players it has a chilling effect on innovation, competition and consumer choice. When we are talking about the written word—the embodiment of culture and knowledge—the stakes are high indeed. Let us not forget that the book business is larger than the global music and movie businesses combined. The Adobe eBook platform is not the only solution to these challenges, but it is an important tool that levels the playing field. Adobe provides essential pre-built technology components and services that would otherwise be prohibitively expensive and time-consuming for each organization to develop in-house. These technologies, along with a globally diverse range of distributors, aggregators, developers, libraries and digital service providers already participating in the platform, create a robust ecosystem that lowers the costs and other barriers to entry for new participants allowing them to quickly innovate, iterate and thrive. The Adobe eBook platform is not just about DRM, albeit the value of having an industry standard content protection solution that is approved by most publishers and authors worldwide should not be underestimated. The platform also includes Reader Mobile Software Development Kit (RMSDK) which offers developers core code libraries to build reading apps for desktop and laptop computers, and mobile platforms such as Apple iOS, Android, Blackberry and others. RMSDK also powers dedicated reading devices. Much of the content read on these devices is free of DRM. This is because RMSDK supports PDF and EPUB, the two most popular open and standard file formats. Adobe Content Server (ACS4) is an important part of this ecosystem as well. It enables retailers to source content from a wide variety of publishers, distributors, and aggregators with a single, common fulfillment API, allowing retailers to offer a richer and more diverse catalog. I sometimes hear folks who say essentially “Game over man!” when talking about ebooks—assuming that the Goliaths already have the ebook cat securely in the bag. To that I say: Wrong, wrong, wrong! Certainly, there are real challenges for smaller retailers to compete in the digital landscape, but hard and impossible are two distinctly different beasts. Brick and mortars can take a cue from B&N and leverage their direct customer interactions to move customers to their digital offerings. Another example in the U.S. is Hastings, a retail chain in the Midwest. Hastings has its own branded iOS and Android apps (powered by Bluefire Reader) and they sell an Android “Nextbook” tablet device (just $149) in their stores that comes pre-loaded with their branded eReading app and integrated store. Small independents can work together to create shared solutions. A good example is the IndieBound apps and platform, operated by the American Booksellers Association. IndieBound offers a huge selection of ebooks and enables consumers to support their local neighborhood bookstore with their ebook purchases. I for one treasure my favorite local bookstore, Elliott Bay Books. Community Bookstores: I’m not talking about High Street communities here. I’m talking about communities based on common interests and lifestyles that are independent of geography. Communities around things like rock climbing, sustainable living, cooking, gardening, zombies and more. Ebook apps can be more than just places to read books—they can become a nexus for like-minded people. Mobile app platforms have the power to easily integrate web-based content. When entrepreneurs combine the ability to manage and read a library of ebooks, with shopping, blogs, forums, feeds, social media and push notifications in a mobile app (centered around topics that people are passionate about) magic will happen. Professional Development: I’ve always felt that ebooks are the best thing that ever happened to professional publishers. Why? In part because of the many ways professional publishers can take a community-building approach as described above. But the huge opportunity is in the unprecedented insight that publishers can gain from the knowledge of how their content is actually being used — e.g., what do users search for, what chapter do they return to repeatedly, what do they bookmark and annotate? I could go on at length about this topic of analytics as I find it fascinating and incredibly promising, but for now we’ll leave it at that, except to say that while this may seem on the surface to be benefits that accrue only to the publishers, if you think about it, the resulting upsides for readers will be just as great. New Business Models: Imagine services like Spotify, Rhapsody, or Netflix—but for books. The possibilities are endless. It’s about innovation. ‘Nuff said. Corporate Apps: Many of us don’t often think of the average enterprise as an ebook publisher or distributor. However, enterprises create tons (literally) of long format content for their employees, partners, investors and customers. Corporations also often buy commercial content in bulk and distribute it to employees. The opportunities for corporations (or any large institution for that matter) to leverage ebook platforms with mobile distribution are immense—and unlikely to be fully addressed by the giant mainstream retailers. Ebook platforms will bring significant cost savings for corporations over print production and distribution, and will empower a wide variety of strategic initiatives: marketing, training, and standards compliance to name just a few. One particular angle that is interesting is corporate ebook lending—as it relates back to those bulk content buys. And many of the points raised in my comments about Community Bookstores and Professional Development above play in here as well. Would corporations like to have insight into which of their documents were actually read (in part or in full) and by whom? I think so. As mobile devices play a larger and larger part of the global economy and in our lives, so will the pivotal role of digital documents in the workplace. I could dive into libraries (e.g., as aggregators of regional content), or the revolution coming in education, and several other promising areas. But I’ll leave those for a different day. Well that depends on who you are. Are you an author? An educator? A publisher? Content manager? Librarian? Are you a bookseller, student or an avid reader? Do you simply want to make sure that consumers have as many choices as possible in where and how they get the media they care about? If you are any of those—and chances are, if you’ve read this far you fit one of those categories—you care about access, interoperability, choices, competition and innovation in ebooks. You understand the power of the written word and the responsibilities we in the industry have. The Adobe eBook Platform is a useful tool for sure, but there are other important digital publishing technologies, and lots of new stuff is coming down the pike: ePUB3, watermarking, open publisher APIs, Windows 8, and more… Our plan is to use the best tools available no matter who makes them. That plan does not including waiting for the newest shiny objects, rather it includes using the tools and ecosystem available right here and now. Because there is one thing we can all be sure of—no one knows what tomorrow will bring.